A heaping helping of comfort food, simmered over the coals in a rural New York home, being remodeled, one bit of plaster and lathe at a time. The zucchini in the garden are loving our weather. And I'm loving the zucchini. Here's what our children had for breakfast this morning. Feel free to substitute things you may have in your pantry, garden or refrigerator for what I listed. This is your scramble! I can make it Trim, Healthy, Mama friendly, and add bread and jam for my children who are not eating on a diet plan. This would be an S meal on the Trim Healthy Mama plan. 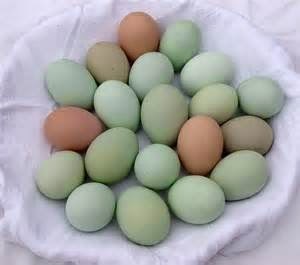 My favorite chickens lay colored eggs. If you don't live near farms -- check your farmers market for the healthiest eggs you can find. Our farmer friend has silly, cheerful chickens who are let out of their pen each morning (where they are safe from Mama Foxes feeding their young kits) to peck at grass and weed seeds and bugs and fruit and watermelon rinds and all the trimmings from the farm wife's vegetables. They look a lot like bowl of eggs. I use a huge skillet, probably 14 inches across. I add some butter or coconut oil, about a tablespoon, and let it melt on low while I'm chopping a large zucchini into very small dices. I pretend I'm a chef on TV, and I use my bright orange handled Rachael Ray knives that Farmboy bought me for my birthday a few years ago. It's great fun to be me sometimes! In fact, I had so much fun with the basic set, that my husband then bought me this for Christmas - Cool but affordable Japanese Santoku chef knife. But I digress. After I toss the zucchini into the hot oil or butter, I finely dice a red or white super sweet onion. We grow the candy sweet variety, but do the best you can with the local sweet onions -- the sweeter they are -- the better breakfast tastes. Put 1/2 of the onion into a zipper bag or a storage container an keep it in the refrigerator for another day or the freezer if you're not cooking again soon and toss the second half into the zucchini. Soften and allow the veggies to turn a little golden, and then add in 1/2 cup of diced ham, or a chopped tin of SPAM, TREET, or other canned brand of luncheon meat. I've also used leftover meat from dinner, chopped sausage, or even bologna, salami, etc. You want about 1/2 cup for flavor. If your meat isn't very flavorful, then a teaspoon of mince garlic is very nice to add. Sprinkle the veggies with some garlic salt or sea salt, and toss it about in the pan, then put the lid on for a moment while you crack open 8 large eggs into a bowl, whisk until smooth, and then pour over your cooked meat and veggies. Stir gently, turn the heat to low, and gently fold inward until the scrambled eggs are done to your likeness. I put the lid on before I think they're finished cooking, and turn off the heat, and get the breakfast plates ready. When I return the eggs are perfect. Scoop into 4-6 portions and serve your family with a smile. I love to top our Summer Scramble with a hearty shredding of Romano cheese made from our goat milk, but a bit of a parmesan cheese wedge, cut off with a fruit peeler into a few curls, makes this very special! Melt oil of your choice in a large skillet 10-14 inches diameter. On medium high add zucchini and onion and soften the veggies, then add cooked meat and heat through. Pour in whisked eggs, turn the heat to low, stir to the center gently when curds form, and right before they look finished and dry enough, turn off the heat and put the lid on. Serves 4-6 depending on how large your zucchini may be. Excellent served with toast with Dutch Apple Pie Jam. That recipe will follow. Today the children ate theirs with 3 cherry tomatoes from the garden on the side, and their scramble made with Spam, zucchini, red candy sweet onion, alongside a slice of bread with butter and homemade Dutch Apple Pie Jam. It's a good meal, any time of the day! Enjoy summer while you can. MAMA Hacks -- or how I fed my children when I just wanted to get a nap! This morning I put cherry tomatoes on their breakfast plates, for the 3 year old and the 8 year old. We had Zucchini ham breakfast scramble, and I just tossed 2-3 cherry tomatoes on the plate with it, for them to pop into their mouth at 8 am this morning. Seems extreme to many North Americans but I assure you the rest of the world has more vegetable intake than us and they eat them at breakfast too. This practice of feeding them the healthiest stuff they might otherwise turn their wee little noses up at began when I had an AHA!! moment one late dinner evening in Griffith, Indiana. I commuted on the train into Chicago's Miracle Mile for my busy jobs with long hours, and I tried religiously to be home by 630pm but that meant they were very hungry when we walked into the kitchen of our ranch style home. In fact after too many nights of take-out, carry-in or take-away dinners, I came up with this Mama Hack. I knew what I was making for dinner, a two week menu posted on the refrigerator. But the children sat at the kitchen table with big wide blue eyes staring at me as I cut up the ingredients and began cooking. They would ask for bites of the components of dinner as I prepared it. 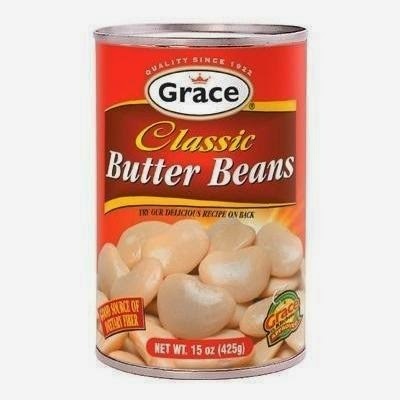 I glanced in my well-stocked but small pantry, and spied a can of large butter beans. I opened it up, drained the beans, rinsing them off and laid a layer of large beans that look like Lima beans on a small luncheon plate and put it in the middle of the kitchen table for the two kids to snack on while I was chopping veggies for our quesadillas on the menu. When I looked back the plate was empty. My two small children ate a can of beans, one at a time, with their fingers. Well, why not? Beans are protein, carbs, and fiber -- and hold good nutritional value. We'll call that their "appetizer portion". I made their quesadillas filled with good food, and fried it in a pan while they happily picked up beans and filled their grumbly tummies. After that I made sure that for each work day we had something ready to go to put on the table the minute they walked in the door from the sitter's home with me. Often times it was a pretty plate of beans, and sometimes it was a bag of raw veggies (like baby carrots, snap peas, or romaine hearts). For the romaine I merely rinsed one, gave it 4-5 quick chops into bite size pieces and then squeezed out some dressing or hummus on a plate and they dipped it with their fingers. Remember, single mama, high food prices in Chicagoland, no access to the farm we're on now, and we'd been out of the house for 12 long hours by the time we walked in. So if you are in a similar or relevant situation and can use a mama hack, try opening a can of green or butter beans or whatever you think your children may start to nibble on, drain it, and put in on a plate in the center of the table, and pick one up and eat it and say yum, those are good and turn your back. Something good may happen! Add dry oats, salt, pepper and spices to your Vitamix or Blendtec and pulse 1-2 times. That makes an oat binding flour, seasoned, of course. Add onion, eggs, Worcestershire sauce, and blend again until you have a smooth mixture with no chunks. Now add meat and just pulse quickly to incorporate meat, but don't overblend. Place it all into a bowl and mix by hand to make sure it's all evenly incorporated . Don't worry if it looks mushy or runny, it just needs to lay about in the refrigerator for an hour or 30 minutes in the freezer (but don't forget it for much longer or ICE!) Preheat your oven now to 375*. Use a click release small diameter icecream or portioning scoop and form iquickly nto 1 inch diameter meatballs or use a teaspoon and it goes slower. Put them on an oiled cookie sheet, not touching. bake for 20ish minutes, at 375*. Cut one in half to be sure it's cooked through, as your cooking time will vary with density of your meatball and choice of meat. 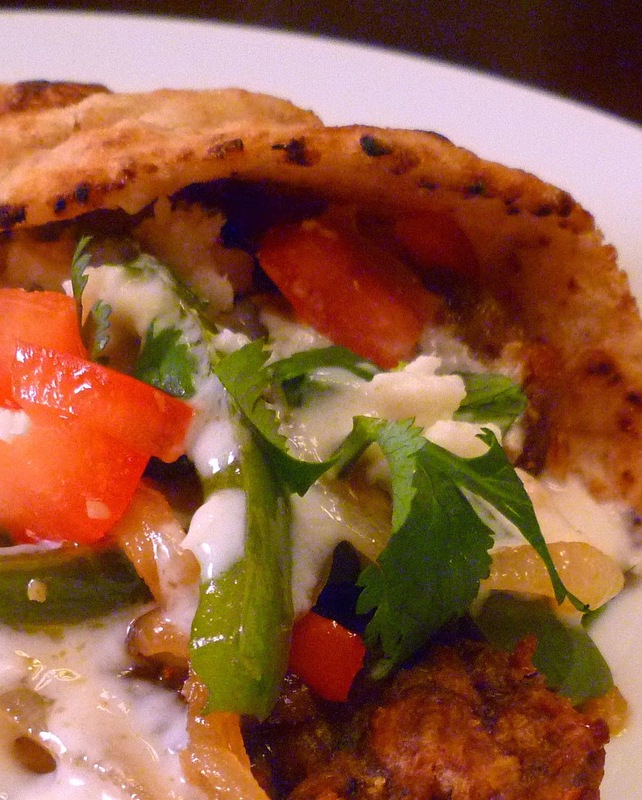 If you prefer, you can make this into 20 flatter patties, and use them to make a Gyro sandwich. This makes about 60 meatbals.. These can be Meatball sandwiches, spaghetti and meatballs, or my personal favorite: Gyro style sandwich: Greek meatballs in a wrap, with lettuce, tomatoes, a little red onion, and topped with Tzatziki sauce. Use a THM plan approved wrap, like half a Joseph's Lavish, or a Low carb whole wheat Mission wrap, or a Joseph's pita, and it's delicious. If you don't have lettuce or cucumbers, you can drizzle some garlicky greek yogurt, add grilled onions and peppers, chop up some cilantro like this photo. But I do highly recommend the Tzatziki sauce.. you'll love it. PS your kids can eat pitas, and stuff this in regular ones, but do stick with the Joseph's low carb pitas for slimming! Take a pita or wrap, smear with some of this lovely thick dip, and then add some meatballs (room temperature is fine too) some tomato wedges, some lettuce and onion, and fold in half and enjoy! 1 tablespoon of fresh chopped dill weed, or 1 Tablespoon of chopped fresh mint, or use a pinch of crushed rosemary plus a pinch of dried basil plus a pinch of dried dill weed if you don't have the fresh herbs. Drain the salted cucumbers, and sprinkle with the herbs you chose, and the garlic. drizzle the lemon juice over the top, and then gently fold in the yogurt. Cover and chill in refrigerator. After it has chilled, stir again and taste the sauce to see if it needs more salt and pepper. Some people use up to 3 cloves of garlic which can make this very spicy. This version is milder, but suit your own taste. Don't be daunted by the seeming length of this recipe it's 20 minutes prep, 20 minutes of cooking the dish, and some of that can be made ahead. If you like, skip down to the peanut sauce portion, make it ahead, and store it for a couple of days in the refrigerator, then heat it back up after you've browned some chicken strips and steamed some vegetables.That's a good piano lessons or soccer practice night speedy dinner, if you ask me. Brown rice or quinoa can always be cooked ahead in chicken broth and reheated in the microwave as a side dish for growing bodies or those who need extra calories. Peanut sauce is hearty and filling and It's quite versatile. At our house it works nice as a dipping sauce for chicken strips on a stick, or poured over a bowl of stir fried veggies and scrambled egg strips. The ingredient you may not have in your cupboard is available in most Asian sections of your supermarkets, labeled fish sauce. 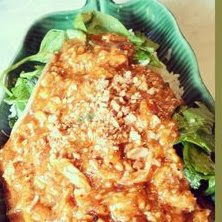 Its salty and pungent, and made of anchovies, but it flavors the peanut sauce deftly, and substitutes fall short. I'll put up a salad dressing for steak salad, that you will use more fish sauce in, so you won't feel like you're doing a one time purchase. I predict your family will ask for this one again and again. 1 medium head (about 2 lbs) of thinly sliced but not shredded cabbage. Think egg noodle width, not coleslaw. You may use green, napa, bok choy, savoy, red cabbage, or whatever you prefer, but you'll need at least 5 cups of sliced cabbage. Or you may substitute thinly sliced broccoli or brussel sprouts, or cauliflower for a part of the six cups of sliced veggies to go with the 10 cups of spinach. Toss chicken strips with salt and pepper (start with 2 tsp. salt & 1/2 tsp pepper) and with 1 teaspoon smoked paprika. Set aside while you heat the oil over medium high heat in a large dutch oven or very large skillet or wok. Heat 2 teaspoons of coconut oil until it's glistening and pan is hot, then toss in half the sliced chicken, and cook until browned on edges but not necessarily cooked through. You will cook more in the end. Set aside in a bowl and add 2 tsp. more coconut oil into the hot skillet and toss in the remaining half of the raw chicken. Cook until browned, and nearly done. Add to the bowl of the browned but raw chicken. To the hot skillet you cooked the chicken in, please add the remaining 2 teaspoons of coconut oil. Drop in the finely diced onions and mince the garlic into it, taking care not to burn the garlic. Cook and stir occasionally, 2 minutes until the onion is tender, reducing heat at the end to medium. Now add your 1 cup of peanut butter to the onions and stir in fish sauce, sweetener to the equivalent of 4T of sweetness, and gently stir in the coconut milk, and add one more teaspoon of paprika, and a pinch of red pepper flakes or cayenne to taste. My children prefer tiny bits of cayenne, here. Get your whisk ready, and sprinkle one teaspoon of gluc or xanthan gum over the top of the peanut sauce and whisk whisk whisk until completely smooth. Now add your mostly, but not completely cooked chicken, to the hot peanut sauce. Let simmer, covered, on low, for the 5-8 minutes as you prepare the vegetables. Heat on medium high heat a large wok or frying pan with a lid. Toss in 1/4 cup of hot water, wait for it to boil, then add the sliced head of cabbage and pour on 1/4 cup of water and several good shakes of real salt. Stir a quick bit, then top with the lid. Let steam on med-hi for 5 minutes, adding 1/4 cup hot tap water at the 2 minute mark if needed to keep steam. Check for tenderness at the 5 minute mark, and add the spinach leaves, push down, cover again, and let the spinach wilt for 2 more minutes. Give spinach and cabbage strips a quick toss with tongs to mix them up a bit, Taste to see if you need salt and pepper, and distribute the mixture to a large platter, making a nest to put the Chicken and peanut sauce upon. Taste your long simmered peanut sauce and chicken. Does it need more salt? Pepper? Cayenne? Now pour in the 1/4 cup fresh lime juice, give it a stir, and taste it again. Does it need another tablespoon of sweetener to balance out the sauce? It should have a balance of salt, acid, sweet, and a little hint or more of spice. If it's just right, then ladle your chicken and sauce right onto your nest of cabbage and spinach. Optional Garnishes: If you like, this is where you may garnish it with 1 cup of chopped peanuts, 1 finely slivered skinny red hot pepper, or cilantro-coriander leaves, a handful of raw mung bean sprouts, or all four. Serve with 1/2 cup of broth-cooked quinoa or brown rice as S helpers, because this is definitely an S meal. Or just enjoy it on your veggies and call it delicious, because it is! This delicious winter stew has a combination of flavors that work so well together that you'll wonder why you didn't grow up with this for dinner every Thursday night during the winter. The second time you make this (and there will be!! ) you might want to double the batch and freeze some for a quick dinner night. Don't be afraid of the unusual, they may turn out to be your favorites. I bought a bag of radishes on the advice of a friend and was timid about making them for my family. We always ate them cold and raw growing up, but this recipe, like several other new ones I've tried, cooks them until tender and gently flavored, like a potato. Really!! My children now love them, and come back for more. Toss some in your next pot roast and you'll see what I mean. Low in carbs, and satisfyingly delicious. Brown sausage, drain, then add the onion, garlic, basil, mushrooms, zucchini, and and sauté until tender. Try the radishes at this point -- see, yummy and not bitter at all!! Add pumpkin to this mixture and mix well. Then stir in the broth and mix well. If necessary add 1/2 cup of water to thin to the consistency you prefer. Add more water as necessary. Simmer 20-30 minutes. Right before serving, add the nutmeg, then stir in 1/2 cup of cream of your choice. Top with a splash of hot sauce in the servings of those who crave the heat. Makes 6 hearty servings of delicious winter superfood. ** (Bake a squash or pumpkin, scoop out the flesh, puree until smooth with a stick blender or in a blender container, then measure 1-3/4 cups). Use the rest to make pumpkin pie smoothies or puddings or muffins. Trim Healthy Mama would count this as S for satisfying. www.trimhealthymama.com sells the book that inspired me and my weight loss. As mothers of large families, they knew how to keep a real budget and feed the family as well as inspire them all to be healthy. I grew up with a mother who cooked for our big family and in a church with a warm-hearted tradition of providing a family meal for funerals. Often this hash brown casserole known as Mormon Funeral Potatoes (or just Funeral Potatoes) was served alongside ham, green beans, and homemade rolls -- food to soothe grieving hearts. Families gathered at round tables in the cultural hall and reminisced of happier days when they were together. This dish holds warm memories for so many, that I had to try this version to keep it on our recipe list while trimming our waistlines in a most delicious way. . Cracker Barrel makes a good one, too, but mine is more slimming, when paired with a low carbohydrate dinner. Try it, even if it is your first attempt at spaghetti squash. First cut squash in half. Use a big knife, stab through the middle and wedge it down toward the outside. Then take out the knife and repeat on the other side working outwards. (It’s easier that way than trying to cut through the whole thing at once). Now remove the seeds. Place in a covered dish with a ¼ inch of water and microwave for 10 -12 minutes, per each medium squash. Repeat for the second one, and check at 12 minutes on the large one, to see if it's tender enough for the strands of the squash to separate with a fork. Or if you prefer, put all your cut squashes on a baking sheet with sides, cut side up in a 350* oven and bake until tender, approximately 45 minutes for all of them. They will look a little bit dried out, and a fork should be able to easily shred the flesh into spaghetti strands, when it's done. You can cook these ahead in the day, and then assemble the squash dish later on, if that's more convenient. Just start with warm or room temperature squash strands. In a medium sized skillet over medium heat, add the butter or coconut oil, onions, thyme and cook until the onions soften but don't yet take on any color. Salt and pepper to taste. Start with a 1/2 tsp. of real salt, as this has to flavor the whole dish, not just the onions. You can add some minced garlic if your family likes it, here too, some ham or turkey chunks, or leftover roast beef to make it a main dish casserole. Add the sour cream and 1 cup of shredded cheese, and stir to warm and melt together. Taste for sufficient salt, and don't forget the black pepper. If you like spicy food, you can add a pinch of cayenne pepper. Reserve the last cup of cheese for the top. Using a fork, scrape the insides of the squash and transfer to a mixing bowl. Pour the warm sour cream & cheesey onion mixture over the fork-shredded squash strands. Gently fold the sauce in, without smashing up the squash. Transfer the mixture to a buttered 13x9 baking dish and top with remaining cheese. If you prefer you can also toss 1/2 cup of low carbohydrate bread crumbs with 2 T of melted butter and top the dish to make a more crunchy topping. Place into a 375º for 25-30 minutes until golden brown on top. If it browns too quickly, cover with a tent of aluminum foil to allow it to heat more evenly all the way through. This is a delicious dish, as S for satisfying fats, on the Trim Healthy Mama plan. If you use 2% cheese and 0% Greek Yogurt, it would be an E for energizing. This can be put together quickly with ground meat, store bought shredded carrots, prepackaged coleslaw mix (shredded cabbage), or your food processor. A quick toss of raw peeled cubes of butter nut squash into the food processor will have this ready in no time! Then a quick stir fry, and you're ready to eat. Fabulous flavor, fiber, and figure friendly fun! Iceberg lettuce, Romain Lettuce, or Other lettuce to make cups or wraps. Butter lettuce makes easy little cups too. Combine the ground meat, green onions, water, soy sauce, sweetener, pepper, garlic, and water. Marinate for 1/2 hour or add 1/4 tsp. meat tenderizer (unseasoned) and wait 5 minutes. Add oil to pan, heat. Stir in meat mixture. Cook until meat loses its pinkness, but not quite done. Remove from pan. Sauté vegetables in a small amount of oil for 2 minutes, then add the water, and cover and cook for 2 more minutes. Taste a shred of squash to see that it's crisp-tender (al dente). Add meat and heat through to finish cooking. Cayenne pepper, hot curry powder mix or red chili peppers may be added to make it spicy for the adventurous eater. Serve piled into crisp lettuce cups, or serve with crisp leaves of lettuce for diners to roll up their own like a soft taco. Quinoa or brown rice cooked in broth is nice served alongside. This is excellent with a Quick cucumber salad. Recipe included below. Peel a large cucumber or leave zucchini unpeeled, slice into matchsticks or rectangles, and set aside. In small bowl, stir 2T truvia into 2 T. of vinegar of your choice. Add 1 tsp. real salt or celtic salt. Stir until crystals all dissolve, add 1/4 tsp. powdered ginger, and pinch of turmeric. Stir well, and toss with match stick cucumbers. Match cut Radishes may be added if desired. If desired a sprinkle of cayenne powder may be added to the dressing. This can be eaten right away. About us.. a second chance. Here's the story of a redhaired lady, who was raising a boy and girl of her own, then one day this lady met this Farmboy who had two small children of his own. The adventures began.... now we have six lactose intolerant children, an oldlywed couple, and 2 dogs, 3 cats,and a small herd of goats.